The OG Mercury Cougar was launched in 1967 as an upscale version of the Ford Mustang, offered for consumption at the now derelict Mercury dealers across this great nation. By 1989 it was a fairly large car based on the Thunderbird, but a much better car than that abominable 1999-2002 Cougar. 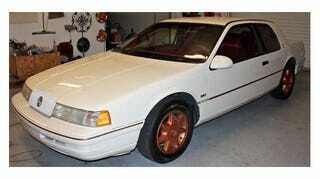 Find this 1989 Mercury Cougar XR-7 Supercharged offered for $2,700 in Jonesboro, GA via craigslist. In its 7th generation, the Cougar underwent a total transformation from the Fox platform to the MN12 (Thunderbird, MkVIII). It was as if the aging Cougar had been given a heart transplant (engine), skin graft (new sheet metal) & bi-lateral hip replacements (IRS) — the only thing that remained were the Cougar badges. The new platform may have been bigger and heavier, but it included a few tricks up the old sleeve that makes it a cool sub $5k car on the market today. Check the XR-7 option on the dealer spec sheet and you were upgraded to the 3.8 liter supercharged V6, the exact same engine that powered Motor Trend's Car of the Year for 1989, the Thunderbird Super Coupe. It was rated at 210 horsepower and could be attached to a 4-speed auto or 5-speed manual and it was connected to the rear wheels via a sophisticated independent rear axle instead of the ox-cart design from the Fox platform. Actually, the solid axle is not as bad as magazine pundits make it sound; drive a live axle Mustang and a Mk VIII Lincoln back-to-back and you would be hard pressed to notice if someone swapped the rear ends. This XR-7 is shifted with the 4-speed automatic transmission, but the Elmo hide interior makes up for that shortcoming with pure wow factor. Who wouldn't want to drive around without pants in this thing just enjoying the soft fur on your bare backside...wait....what if the previous owner had the same idea...scratch that...in fact, get a thorough post purchase cleaning on this thing from one of those professional crime scene hazmat teams if you get the chance, maybe new seat covers too. Originally posted as 5k: Supercharged: 1989 Mercury Cougar XR-7 on Daily Turismo.